A real angler needs a reel repairman. That’s where Ross Hutchisson comes in. 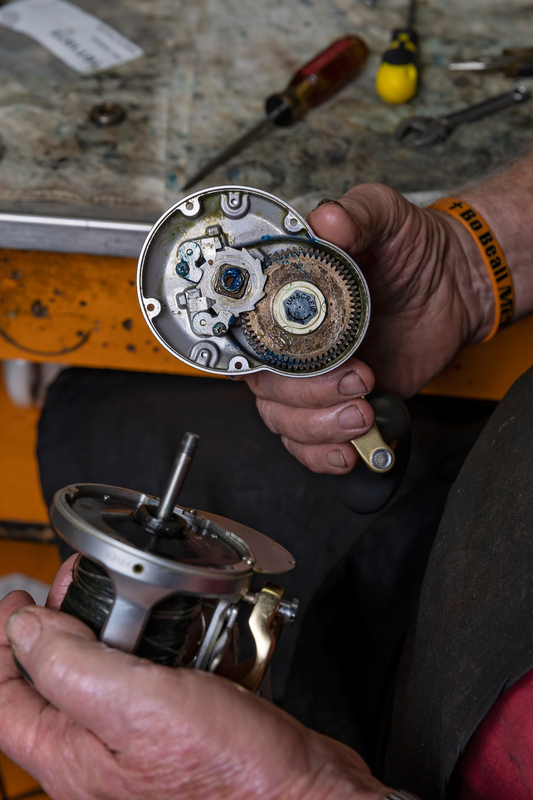 With one fishing reel already disassembled, its inner workings laid out on the workbench like a murdered clock, Ross Hutchisson reaches for another. The paper tag dangling from the handle of this second reel gives him the diagnosis — something about a faulty drag gear. Without ceremony, the fishing reel doctor grips a drill and begins surgery on yet another patient. After a few quick bursts of the drill, Hutchisson exposes internal gadgetry, much of which is coated in a black, oily residue. He explains that this substance is a by-product of saltwater fishing that, if not cleaned out regularly, can really “gum up” gears. Within seconds, he notices something else. Hutchisson says he sees this a lot — customers trying their hands at repair work before admitting they need the help of a professional. The only difference between these tinkering amateurs and the man whose help they seek is time. The 76-year-old Hutchisson is self-taught. Having “always diddled” with fishing equipment, he turned that hobby into a career more than 30 years ago. Multiply that by the “500 or 600” pieces he estimates he works on in a year, and you realize that Ross Hutchisson has helped a lot of people catch a lot of fish. 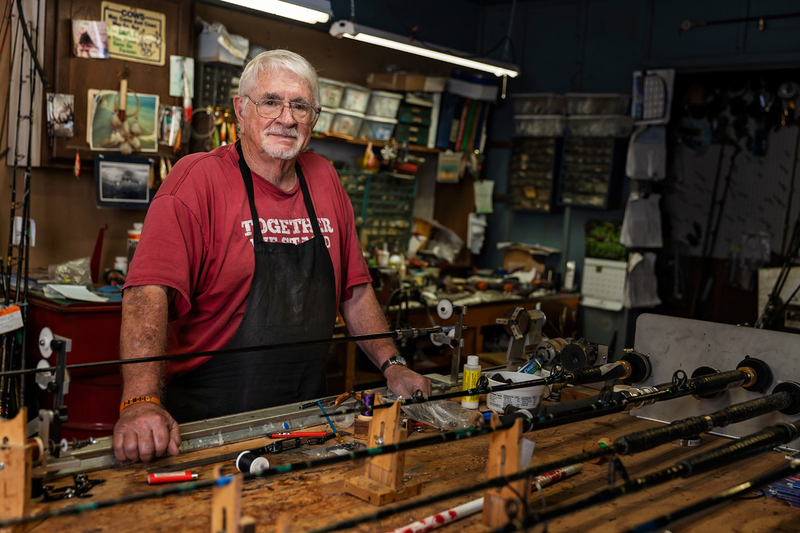 In the workshop behind his home in Mobile, Hutchisson and his dog of 13 years, Ginger, sit among screwdrivers, brushes, spools of line, retired lures, cans of grease and fishing pictures of old. Two 5-gallon buckets on the floor hold a dozen or more reels needing maintenance, and countless fishing rods stand in clusters like forests of bamboo. After attending McGill Institute (now McGill-Toolen), Hutchisson joined the Army, a decision that required his parents’ signatures since he wasn’t yet 18. He says his most memorable time in the service was the three years he spent in Germany, where he witnessed the building of the Berlin Wall. Upon returning to Mobile, he found work repairing tugboats on the waterfront, got married and started a family. After switching to a career in finance, Hutchisson decided to pursue a dream. And so Hutchisson opened up Bow to Stern Supply at Springhill Avenue and I-65. “I kept it open for nine years, and then I decided I either had to get big or get out. So I got out. But I had built up a clientele doing this stuff,” he says, gesturing around the workshop. After a stint working for Sports Unlimited in Mobile, Hutchisson finally decided to commit to his own rod and reel repair operation full-time in 1987, and he hasn’t looked back since. Business comes from several sources: a few charter boats out of Dauphin Island, Sam’s Bait and Tackle and The Rod Room in Orange Beach. “Those places don’t send just one or two reels,” he says. “It’s 10 or 20 at a time.” And of course, there are other regulars. Hutchisson also builds custom rods, although the time-consuming nature of such work limits the number of projects he can take on. Building a rod, he explains, is the process of starting with a “blank” rod (usually made of fiberglass or graphite) and adding its components from the top down. Not only is he building a rod suited for a particular type of fishing, but he’s also flexing his artistic muscle. A customer might ask for a certain color scheme or design, which Hutchisson achieves using spool after spool of colored thread. This “weaving” or “thread art” requires as much time as it does skill. “I’ve done some rods that have taken 6 or 7 hours just to do the base wrap,” he says, standing before enough spools of thread to reach Cuba. Could it be that the fishing reel mechanic is also a bona fide artist? “I don’t know about all that,” he says. 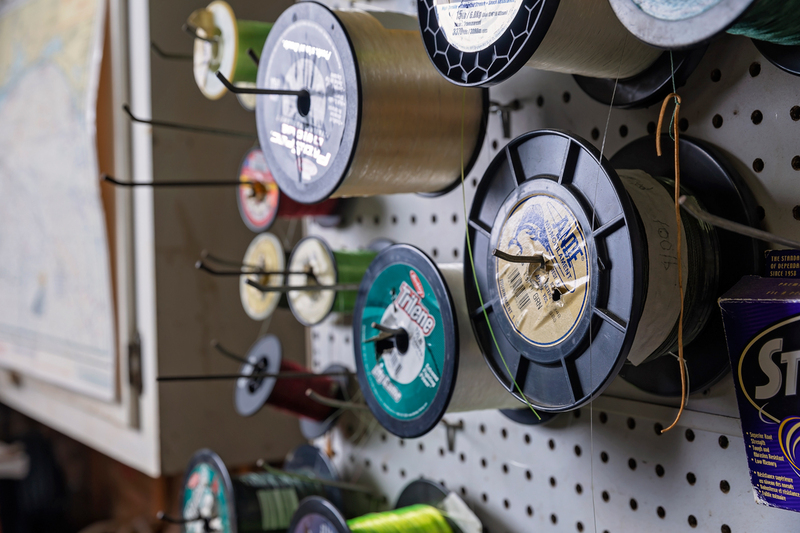 Fishing line and spools of thread cover the walls of the eclectic workshop. He would know. Since his early days working at Bow to Stern Supply, Hutchisson has attracted troublemakers and fabricators like fish to the hook. “We have a lot of geehawing at times,” he says. “Now when I had my store, there used to be regulars, and I’d let them sit around … Next thing you know, you’ve got more lies than you can shake a stick at. “It was a gathering place, so to speak. Everybody would come in and tell lies about what they caught over the weekend or what they didn’t catch.” Hutchisson says there’s still an element of that at the carport workshop, but it’s nothing like the early days. Just four minutes later, Hutchisson looks toward the door. “Here’s a fisherman now,” he says. As if on cue, a man named Johnny, “one of those 25-year customers we talked about,” has come by the shop to drop something off. In the days leading up to our interview, I had heard Hutchisson referred to as Mobile’s “priest of fishermen,” a man in whom you could confide about that one secret fishing spot, without fear that he’ll spill the beans to his next “geehawing” customer. But Hutchisson says there aren’t many secrets left these days. “With electronics now, fish don’t even have a chance,” he says. Although the secrets might have dried up, the conversations that occur within these walls are no less important — perhaps a unique form of therapy? “Probably,” Hutchisson agrees. “For some of them, it is. A break in the action, so to speak. They come by here, like Johnny, and catch up on what’s going on in Mobile fishing news.” Just don’t expect love advice from the man tuning your reel. Hutchisson acknowledges the work beats a desk job, but there’s no denying it can be both highly technical and stressful. He has always had to fight to keep up with the changing market. New rod and reel companies and technologies spring up almost overnight, or a long-standing company will suddenly change the numbering system of its spare parts, knocking his inventory out of whack. But Hutchisson keeps diddling away, knowing that such challenges, like cows, come and go. After all these years, there’s little that the doctor, mechanic, artist and priest of fishermen can’t handle.